Integrated scanning + OCR: Why is this feature important for Document Management System? Home/Blog/Integrated scanning + OCR: Why is this feature important for Document Management System? The main purpose of document management software is to digitize documents and reduce paper clutter in the office. This is why it is important your software provides advanced scanning tools that allows you to scan high volumes of paper at a fast pace. You can scan text, images and drawings and convert them to PDF. This reduces paper clutter and dependence on traditional filing structure. However, your job is not done here. 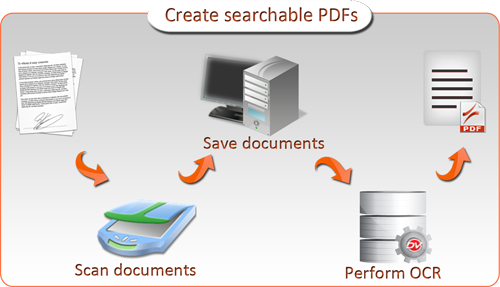 Once digitized, your documents need to be made fully searchable and this is where OCR comes into the picture. Docsvault’s inbuilt scanner interface is much easier to use than conventional scanner interface and gets work done quickly. It can allow integration with more than one scanner in your organization, so you can choose the scanner you want to perform the job with. Docsvault will automatically detect all TWAIN-based scanners installed on your computer. OCR or Optical Character Recognition is a process that allows you to make your paper documents fully text searchable. It does so by recognizing and converting the image of the text on the file into a text document. This is the most important feature for any document management system because this feature makes all your files searchable by the content within. One of your employees scanned an invoice a few months back. He is either no longer working with the company or is on a long holiday and you need that invoice urgently. You don’t know the name of the company, date of the invoice or the date it was scanned and stored in Docsvault. All you know is that this invoice was received when your company purchased furnishings a couple of months back. You simply search keywords like furnishings, drapes or wallpaper that could have been mentioned in the invoice and all the files related to those keywords will be displayed. What could have taken about 3 days to 3 weeks can be done in less than 3 minutes. Integrated scanning and OCR are the most powerful features for any document management software.